There are actually two words: Tantien and Hime. Western cultures believe that the soul resides in the heart. The eastern cultures believe their centre is lower, behind the belly button. Reminds me of Leonardo da Vinci’s “Vitruvian Man“, shown here. Meaning princess. My father used to call me his little Indian princess when I was a child. Later on, he used it again and it stuck. Now, it’s a nickname. I always loved both cultures so it is a homage to them both, but different enough to make it unique. My mother found this photo recently. 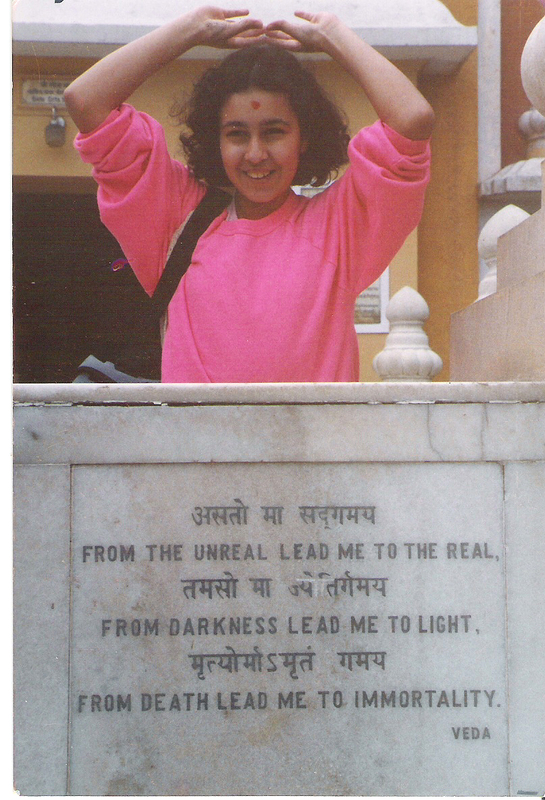 It was taken in India when I was 12 years old. Though I’ve been using this title for a while now, it appears that I’ve been detined for “The Princess of the Eastern Soul”. I’ve interpreted the name to be the the princess of the energy. I’m never the ruling one, which I’m okay with and always full of energy and light. I wanted to leave this description for a topic of conversation, kind of a starter. But maybe this will start a few more. Enjoy. I love the linguistic creativity of your blOg name. It carries a lot of love and discovery. I also enjoy playing with words. Both my blogs are a play on words, yet I remain in the realm of English. Thank you for sharing the story 🙂 happy blogging! I knew your father is Hindu (and your mother Brit) but didn’t know you’ve been to India. Nice story; the photo doesn’t look much like the Shanta I met in Toronto, though. Hope all is well with you. Namaste! It is actually me in the photo! Let’s just say I’ve improved with age like a fine bottle of wine. All is well and hope it to get better. How about you? Hope you enjoyed my blog. Love this story!!! Love the name! Glad you enjoyed it Esterina. Got your blog up and running?